Banco De Oro is now facing another scam allegation inside their business. With the piling-up claims against their services, people are starting to doubt their “We find ways” one-liner. 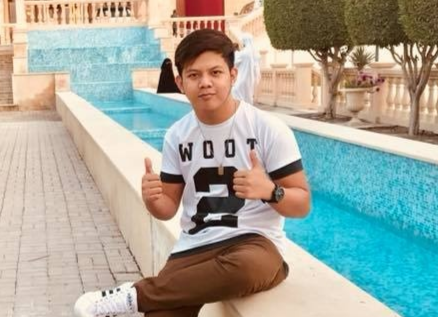 Jester Menes Javierto brought his extreme dismay to BDO for a suspicious transaction. He lost 29,000 in a transaction he did not initiate. According to Jester, he received an OTP around Oct 30 and somebody called him up claiming as an agent from BDO and asked for the OTP number. Given the bad signal, the line was cut. The young man noted that he did not give any details to the caller. Come 5th of November and realized that his account was deducted with 29,000 pesos. Worse, the victim learned that his registered number in the bank was changed without him requesting for it. He then reported the case and received a letter after 20 banking days. The letter stated that the money was non-refundable and advised to personally talk to the Branch Manager. Javierto only got negative answers from the Branch Manager who seems to have no knowledge of his case and technical concerns. 1. According to the letter from BDO, the transaction conducted is “fund transfer” whereas he found out that it was transferred through cash pick-up via remittance center. Even disclosed the details of the receiver from Binangonan, Rizal. 2. His registered number was changed via phone call in which the agent did not perform thorough verification. 3. The fraud department can’t provide an explanation on the case. Jester wanted to seek justice but inasmuch, he wants to fix the situation under no legal circumstances. However, if not permitted, he’ll be pushed to file a case against the bank. Sobra kayong nakakaSTRESS!! Oct 30, 2018. May nagsend ng OTP sa number ko and then may tumawag na taga BDO daw siya (+63 918 617 0096). The line was not clear kaya naputol na. At ang reason ng tawag niya eh yung OTP number na sinend sakin. NakakaBOBO no? Napaka coincidence na may tumawag na taga BDO after na may narecieve akong OTP. Pero in the end of conversation “WALA AKONG BINIGAY NA DETAILS”. Then Nov 5, 2018 nakuhanan kami ng 29,000 PHP sa account namin. At ito pa Malala, “NAPALITAN ANG REGISTERED NUMBER KO NG WALA AKONG KAALAM ALAM”. Okay nireport namin and nakareceived kami ng letter after 20 banking days. At ang nasa letter naming eh “NON-REFUNDABLE ANG PERA NAMIN” reason?? “WALANG MAKAPAGPALIWANAG”. In the picture below, kausapin naming daw ang Branch Manager naming. Ok, nakausap na namin. Unang tanong ko, may access ba siya sa reference number naming? “WALA”. May alam kaba sa issue na nangyari sa account ko? “WALA”. Mapapaliwanag mob a kung bakit hindi irerefund ang pera ko? “HINDI”. We just waiting and wasting money to call the BDO Call Center for more than a month and they will say “WALA SILANG ALAM, PERO HINDI IREREFUND AND PERA NAMIN”. NakakaBOBO sobra. So ako na mismo nag conduct ng investigation habang nagiinvestigate pa daw “ULIT” sila. Naginvestigate na nga kayo, nagbigay na kayo ng sagot na hindi niyo irerefund pero wala kayong mapaliwanag kung bakit?! GANYAN NIYO TRATUHIN ANG MGA CLIENT NIYO. NAKAKATAKOT NA KAYO SOBRA. ANG HIRAP NG IPAGKATIWALA ANG PERA NAMING OFW SAINYO!! 2nd Investigation: So papaano napalitan ang registered number ko na sila na mismong may sabing walang “SYSTEM BREACH”? Nov 4, 2018. Someone called the BDO Call Center Hotline then she/he requested to change the registered number. Ito ang malala, “SOMEONE CALLED AND REQUEST TO CHANGE MY REGISTERED NUMBER WITHOUT USING MY OWN REGISTERED NUMBER” ok they verified it thru “PHONE CONVERSATION” at iyun na pinarocess na nila ang request. REASON FOR CHANGING? “WALANG NAKAINDICATE” ay taragisan naman talaga. Sa BPI bago mo mapalitan ang Registered Number kaylangan pa nila ng hand written signature na isesend mo via email. Pero sa BDO? ONLY PHONE CONVERSATION WITHOUT USING THE REGISTERED NUMBER OR VALID REASON OR NOTIFIYING THE REAL ACCOUNT HOLDER. Mapapalitan na nila ang Registered Number mo. Grabe ang Security niyo pala BDO! ni hindi man lang kayo nagsend ng notifcation or any verification code kung kami ba talaga yung tumawag sainyo! Grabe and SECURITY NIYO!!! LAHAT NG MAY ACCOUNT PALA SA BDO HINDI LIGTAS BASTA ALAM NAMIN ANG LAHAT NG DETAILS NUNG TAO!!! KAHIT SECRET QUESTION ALAM NILA SANA NAGBIGAY KAYO NG NOTIFICATION SA REAL ACCOUNT HOLDER!!! Hindi niyo ata alam gaano kahalaga ang Registered Number kung saan isesend niyo ang OTP niyo eh?! (+63 936 209 4868) ito yung tumawag sa BDO and yan na yung naka register sa account ko. 3rd Investigation: Pina retrieve ko ang call nung Nov 4, 2018 kung saan napalitan ang registered number ko. And they found out na “AKO DAW ANG TUMAWAG AT VENIRIFY NG BDO CALL CENTER AGENT”. Nagpapatransfer ako sa Fraud Department, walang makasagot. May makapagpapaliwanag ba na ako talaga ang tumawag? “WALA”!!! 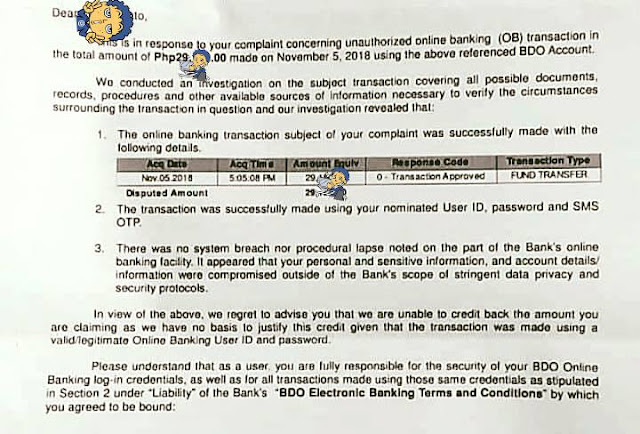 BDO BANK KUNG GAGAWA KAYO NG INVESTIGATION NIYO AT MAGBIBIGAY KAYO NG LETTER NA HINDI NA IREREFUND ANG PERA KO. SANA MAPALIWANAG NIYO SAKIN! HINDI YUNG PINAGPAPALIT PALITAN NIYO AKO NA PARANG GINAGAWA NIYO NG TANGA. GANYAN KAYO SA CLIENT NIYO?! GUMAWA KAYO NG ACTION WITHOUT ANY REASON. SA LETTER NIYO PA LANG MALI NA EH. FUND TRANSFER? 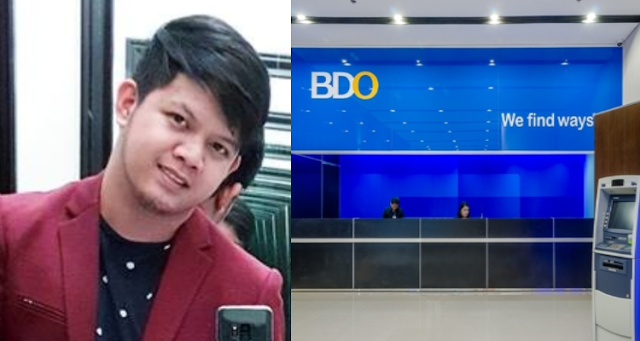 KAYLAN PA NAGKAROON NG FUND TRANSFER MULA SA BDO BANK TO REMITTANCE CENTER? KELAN PA?! CINOCLOSE NIYO ANG CASE NAMIN NG WALANG MAKAPAGPALIWANAG. PINAOPEN KO ULIT AND THEN 20 BANKING DAYS ULIT ANG IINTAYIN KO BAGO KO MAKUHA SAGOT NIYO?! NAKAKALETSE NAMAN TALAGA. Ma’am we called BDO and asked them if it’s possible that we talk directly to you since you’re the signatory of the decision made by the bank. All we need are basis why you guys came up with the decision not to refund our money. It’s a hard earned money from an OFW who worked hard away from her family to help her dad in his sickness. Also, as the account holder, I believe that I have the right to know the explanation behind the decision you guys made. As much as possible, I don’t want to blow things out of proportion and please don’t provoke me to ask for legal and media assistance. Everyone from BDO now seems to run away from this situation. I am looking forward to hear from you and will be waiting from a call from your team to resolve this matter with fair judgement.